The finest clocks from the English Golden Age – the period c.1660-1725 when huge strides were made in horology – are rare on the market. But this category embraces collectable timekeepers from all periods and places – from German table clocks and the classic Georgian longcase to the Victorian slate mantel clock and the advent of electricity. This trio of clocks – all classic collectors’ pieces – went well above estimate at spring sales. This early 18th century Louis XIV French table clock is part of a selection of 19 early European timekeepers that feature in Heritage Auctions’ fine and decorative arts sale in Dallas on March 8-10. Good times at the Oxford rooms of Mallams (20% buyer’s premium), when all bar one of 56 clocks got away almost all going comfortably above estimates. After re-booting the moribund firm of Hutchinson Scott (20% buyer’s premium) in 2016, former dealers Michael Scott and Paul Hodson have now bought their premises at Embsay Mill at Skipton. By contrast to electrical rarities offered in Wiltshire also covered in this week's hammer highlights, the type of mid-19th century library clock shown below is probably the most popular item in the current horology market. Although ubiquitous for much of the 20th century, electrical masterclocks regulating other timepieces in schools, hospitals, government buildings and factories are as yet among the least researched aspects of horology. Fontaine’s in Pittsfield, Massachusetts, is holding one of its periodic horological auctions on November 17. 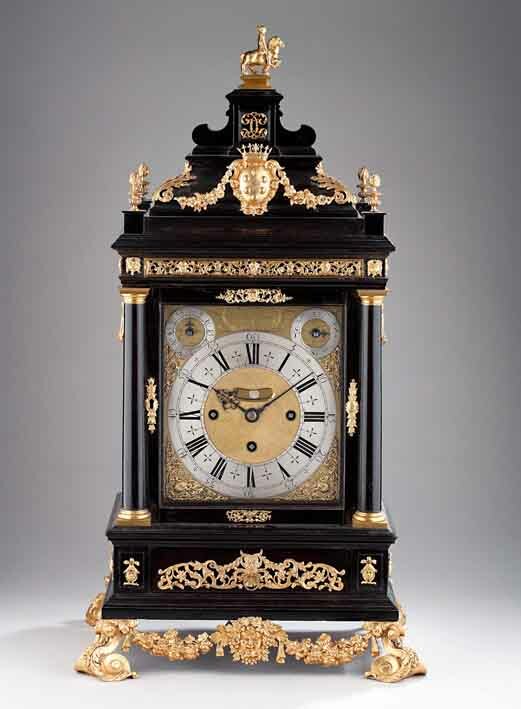 A portable table clock by Thomas Tompion sold for a top-estimate £200,000 (plus 20% buyer’s premium) as part of a mixed-owner sale conducted by Hansons at Bishton Hall, Staffordshire. Anthony Woodburn, who has just died after a long and very brave struggle against myelodysplasia, was the leading dealer in English period antique clocks for the last 40 years.